We have recently fallen in love with making Instant Pot Bone Broth. It's easy to make, delicious to drink and filled with nutrients. Whenever we make it we make it in bulk, using at least 4 pounds of beef bones at a time. 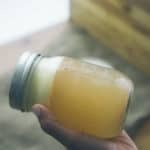 The process of making bone broth with an instant pot is a simple five step one, with some additional steps, if desired. Boil the bones: Add all the thawed bones to a large pot, fill with water and bring to a boil. This will rid them of any nasty bits that might be on the bones. You'll see a discolored looking foam rise to the top as the bones boil - this is a good thing, and you will drain it off. (Always) Roast the bones: Drain off the bones, layer them onto a baking sheet and roast at 400 degrees F for 20-25 minutes. The bones will caramelize and brown resulting in a lot more flavor, and since when is more flavor a bad thing? 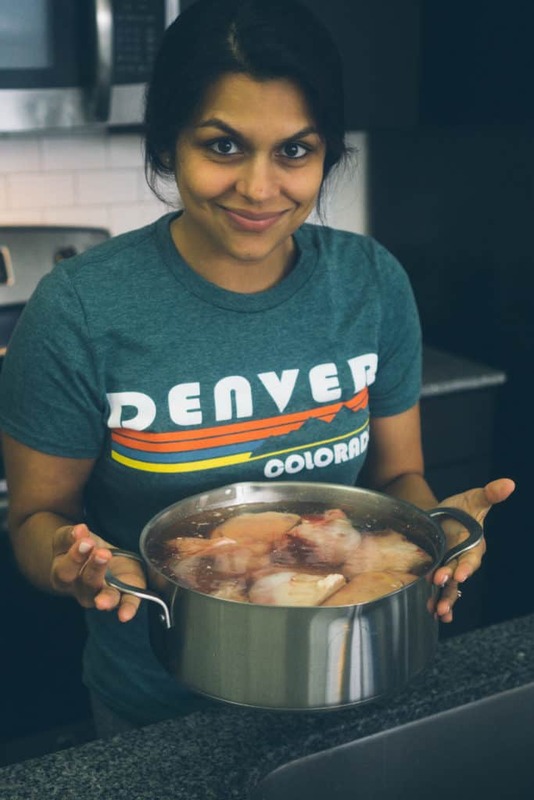 De-glaze pan and transfer to Instant Pot: Place the bones into your instant pot, de-glaze the roasting pan with a splash of water to scrap up all those delicious little brown bits and pour over the bones. Fill the pot with water submerging all the bones, toss in a bunch of salt (we prefer pink salt) and put the lid on. Pressure Cooking: We use this instant pot. Press manual and set the minutes to 240 minutes (3 hours). Anywhere from 2.5-4 hours depending on the amount of bones and time you have will work great! Cooling and Storing: Cool the broth down as quickly as possible to prevent any bacterial growth. 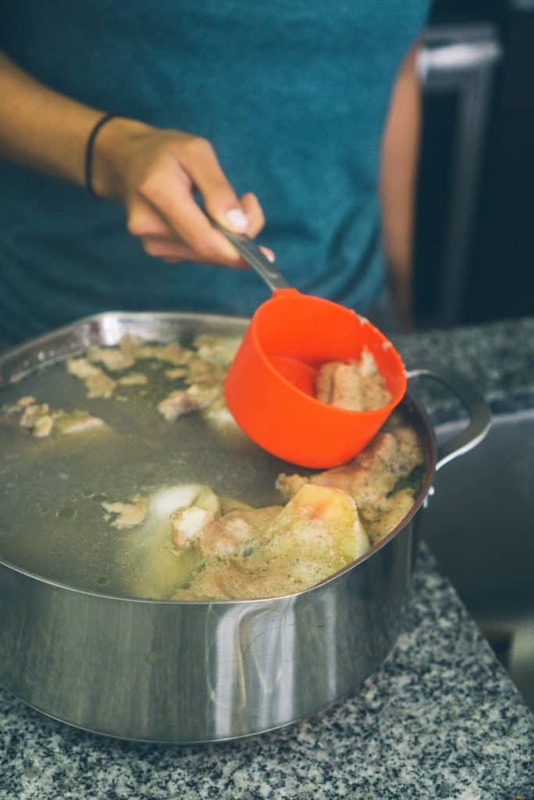 Strain the broth into a large bowl to allow it to cool quicker - adding ice cubes or submerging the bowl in an ice bath. Transfer cooled broth to ball jars and seal tightly. Store in fridge up to 7 days or freeze up to 2 months. When looking for bone broth bones you can use any mix of beef, chicken and pork bones, however, we like to stick to beef. We've only ever found bones in Whole Foods and they have great variety and grass-fed options. You can also ask your local butcher or look in the freezer section where they are usually stored for fresh keeping. 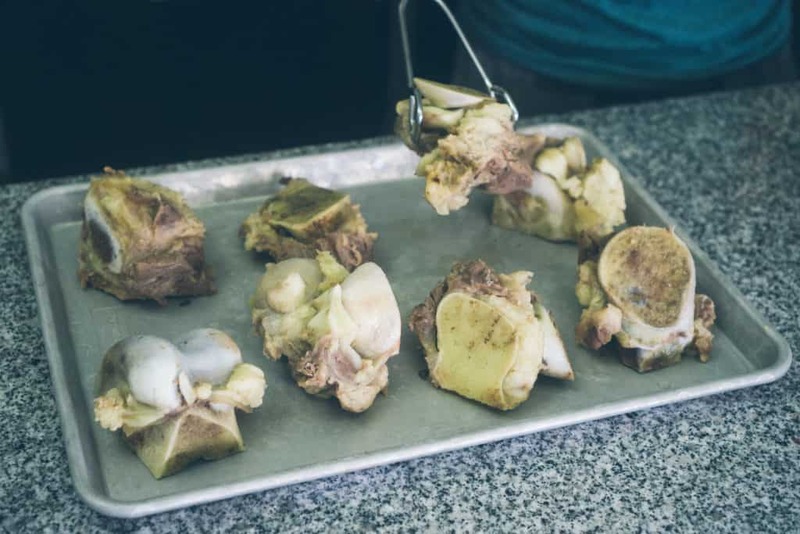 The best bones are those rich in collagen, like marrow and knuckle bones, but we also like some meaty bones for flavor, such as oxtail or shanks. You can see in the picture above that a lot of the bones have meat on them! 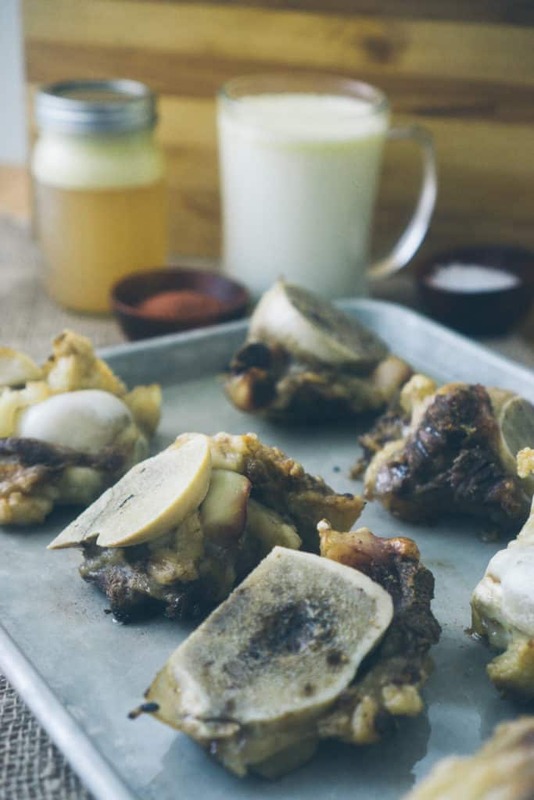 You'll know you picked the right bones once your broth cools and gels over. You can use homemade bone broth in so many ways! 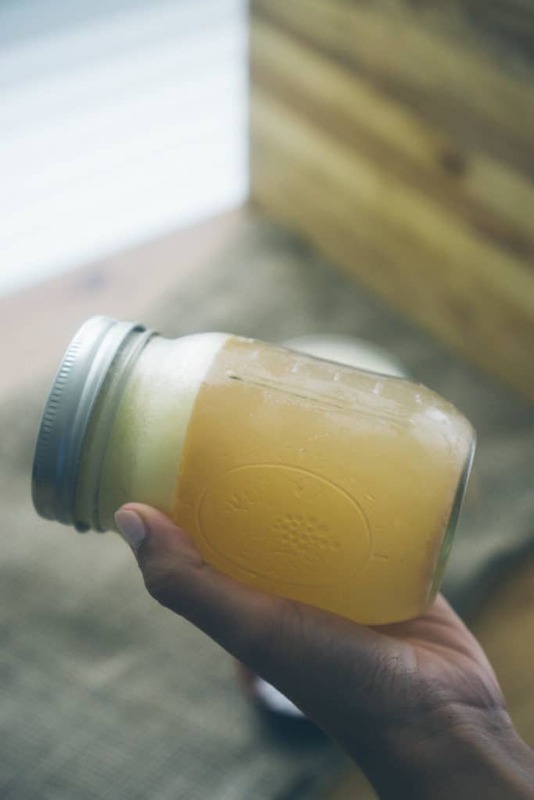 Sip on it for a warm, flavorful drink - you can even add fats to make it bulletproof and up your fats on the day! Drink it when you're sick to get in some nutrients even when you're not hungry. Use it in soups, stews or chili. ​Use it to make a gravy for your mashed cauliflower. Easy, Instant Pot Bone Broth! 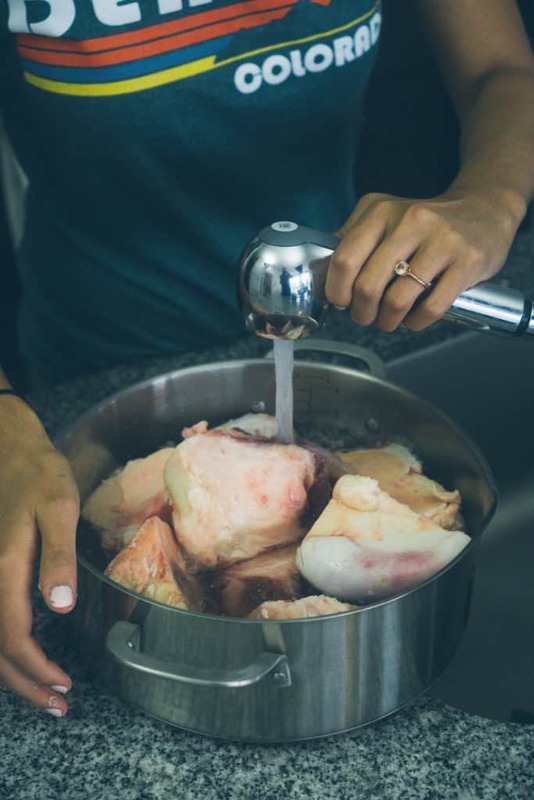 If this homemade instant pot bone broth recipe is still too complex for you we like a couple brands you can give a try. We always have Lono Life Bone Broth in the house and we occasionally like to get Fire and Kettle if it's on sale. The benefit to homemade, Instant Pot bone broth is that we know exactly what ingredients go into it and cup to cup comparison it's cheaper than buying it! Stove Top Instructions: Complete steps 1-3 as instructed, but instead transfer the roasted bones to a large pot (at least 6 ct). Cover the bones with water and apple cider vinegar and allow to rest for 30 minutes to an hour. Turn the heat on to high heat and bring to a gentle boil. Reduce to a low simmer, skimming the foam off the top, as it accumulates. Cover with a lid and keep the bones and water at a low simmer from 12-24 hours. Add more water as it reduces to keep the bones submerged. *The longer you simmer on the stove top the better and more nutrient rich the broth is. *Bone broth nutrition will vary highly batch to batch so cannot be easily calculated when making it homemade. Add the thawed bones to a large pot, fill with water and bring to a boil, cooking for a total of 20 minutes on the stove top. Skim off the discolored foam that has accumulated at the top of the water and drain the bones. Clean off the bones, if any excess foam residue is on them and then transfer to a large baking sheet in a single layer (using two if necessary). Roast for 20-25 minutes. Remove the roasted bones and transfer to your instant pot. Deglaze the pan with a splash of water and scrap up any of the brown bits. Pour the bits and fat from the pan over the bones in the instant pot. Fill the pot with water, submerging all the bones. Add in the salt and seal with the instant pot lid. Make sure your nozzle in on seal when cooking. Cook for 3-4 hours on manual pressure. Allow to rest 20 minutes before opening the instant pot. Strain the broth into a large bowl to allow for quicker cooling. Add ice cubes to the broth or submerge the bowl into a large ice bath. The broth should come down in temperature, cooling at most for 20 minutes. Transfer the broth to mason jars and seal tightly. Store in fridge up to 7 days or freeze up to 2 months. Enjoy as a warm drink or in recipes!